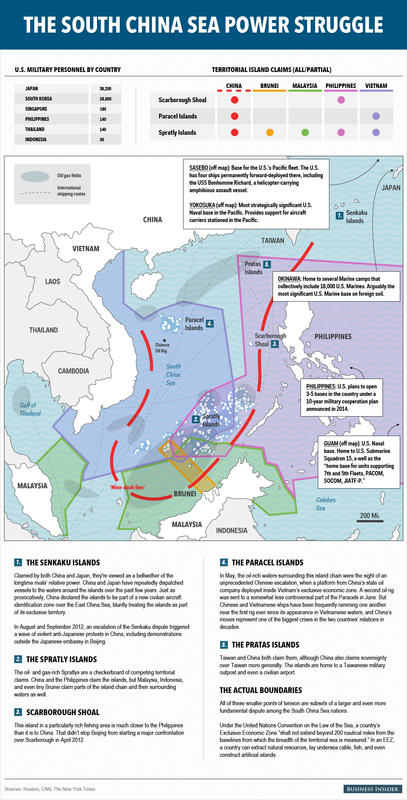 The South China Sea is a powder keg of territorial claims mixed with oil and gas resources. Almost every country in the area has a longstanding animus toward at least one of its neighbors. China claims 90% of the Sea, and Beijing is viewed with fear and suspicion throughout the region. The U.S. and Chinese militaries are both entrenched there — Japan is slowly building its military capabilities in the face of a perceived Chinese threat while Vietnam and the Philippines are emerging as regional players. The South China sea is where the world’s next major interstate power struggle will play out. Any blowup there will almost necessarily involve China and the U.S., which have the two largest economies on earth. But the confrontation has already begun, with China claiming everything within its now-infamous "nine-dash line," and nearly all of its neighbors involved in disputes along the line's edges. Between April and June of 2014, Japan scrambled its fighter jets 340 times "in response to feared incursions on its airspace." What's still unclear is just how bad things could plausibly get there.